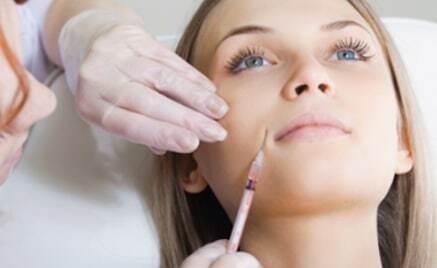 Injections of dermal gel fillers are used by plastic surgeons for correcting many cosmetic problems, including treatment of wrinkles, marks after acne, bags under the eyes, as well as to fill the person’s contours in the area of cheeks, chin, lips, and between the eyebrows. The majority of gels, that are commonly used for contour plastics, are made from natural substances such as collagen and hyaluronic acid (a natural element that skin contains), which are injected by a plastic surgeon just under the patient’s skin to enhance the desired volume. 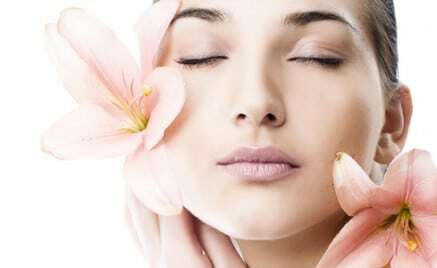 The skin consists of outer layer, called the epidermis, and internal – dermis. There is also gelatinous layer of hyaluronic acid between them, which decreases as a person is aging and leads to changes in the contours of the face. Injectable dermal fillers can often correct this problem. Gel filler serves as a supplement to scarce hyaluronic acid and restores skin volume and elasticity. The procedure is performed in the office of a plastic surgeon and external anaesthetic cream is often used as an analgesic, although local anaesthesia can be employed for the lip contour correction. The procedure, which is considered somewhat uncomfortable, involves tiny injections of the filler that are injected under the skin with very fine hypodermic needle. Contour plastics procedure with the help of gels can take up to one hour, but in most cases it lasts from ten to thirty minutes. Most patients can return to their everyday routine after just a few minutes, but if the changes are more significant – the recovery period can take several days. Discomfort is usually minimal and can be easily removed with bags of ice or painkillers. Problematic areas are a delicate skin around the mouth and nose. However, the results of a procedure can be seen immediately, and the positive effects of plastics usually last about nine months, and in some cases – one year. 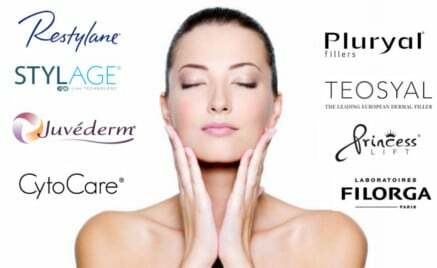 JUVEDERM – is a dermal filler used for filling and smoothing wrinkles and folds on the face. Modern versions effectively add volume, tighten the face and enhance its contours. JUVEDERM is made of hyaluronic acid, which helps to maintain optimal volume and water balance and has a positive effect on the elasticity of joints. Hyaluronic acid retains moisture and connects with collagen and elastin, providing necessary nutrients to the tissues that keep the skin in good shape. 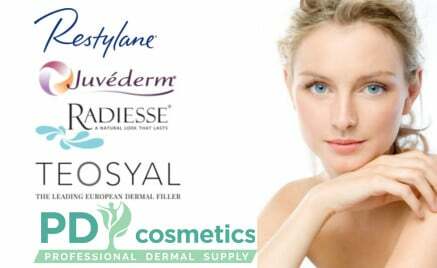 It is worth mentioning, that hyaluronic acid used in JUVEDERM, and the following fillers, is not obtained from animal sources. Restylane is also made of hyaluronic acid, but is mainly used for small wrinkles on the face, not to lift and change the contour of the face. Restylane is often combined with Botox to improve the efficiency and duration of the results. Perlane is produced by the same company and the same hyaluronic acid as Restylane. The difference is that the particles of this gel are more massive, and thus Perlane is more effective to fill deep folds and it can be used to achieve more volume. Perlane is often used to increase the volume of the lips and other parts of the face that look much younger after professional medical treatment. 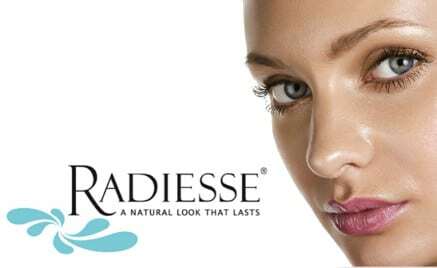 Radiesse is not made of hyaluronic acid, but microparticles based on calcium dissolved in the water-based gel. Radiesse provides instant and long-lasting result, because it stimulates collagen production and promotes tissue regeneration. It is often used for smoothing nasolabial folds and vertical wrinkles that go from the corners of the lips to the chin, as well as to increase the volume of cheeks and to fill in the sunken areas under the eyes. Artefill – is the first and the only dermal filler that does not dissolve with time. It is renowned for providing permanent supportive structure for sustained wrinkle correction, which means that its effect is immediate and resistant. Artefill is made of polymethylmethacrylate microparticles. This material is used for years as a part of surgical implants. However, since it is not a natural substance, there is a risk of allergic reactions. The results of the procedure are considered to be permanent. Doctors who use Artefill certainly prefer to introduce a small amount of this gel at the first procedure, adding more during the following procedures, if necessary. Usually full result can be seen in six months. Sculptra is generally used to treat lipoatrophy, lack of fat tissue under the skin, which sometimes leads to the fact that the cheeks become dropped, and depressions and dents can appear on the face. The main component of the gel Sculptra is poly-l-lactose, biologically compatible substance that does no harm adjacent tissues. Unlike other dermal fillers, Sculptra does not bring immediate results. It works by stimulating the production of collagen, so the result appears gradually over several months. Usually you need from three to five procedures, and the results can remain for two or more years. Lipofilinh – is a procedure in which fat is used, taken from the patient’s own body. It helps to reduce the risk of allergic reactions because of use of own tissues. However, not all fat cells are stored at this procedure when they are transplanted to another part of the body, so you can expect a high level reuptake. That is why doctors usually fill processed area more than necessary and the patient may look unusual for some time. It is important to know that not all dermal gel fillers are equal, and each has an individual purpose for which it suits best.